Viktoria Franken is an experienced organbuilder and joins us, newly arrived, from her native Germany. She started building organs in 2008 at H.P. Mebold Organbuilders Siegen/Germany where she worked as tonal assistant (pre-voicing) and also was trained in the historic craftsmanship of organbuilding. She earned a “Certificate of successful completion” from the Oscar-Walcker School for Organbuilding in Ludwigsburg, Germany and also received a “Certificate of apprenticeship in Organbuilding” from the chamber of crafts in Stuttgart, Germany. She worked also for Killinger Pfeifen in Freiberg, Germany obtaining special skills in assembling and pre-voicing reed pipes. 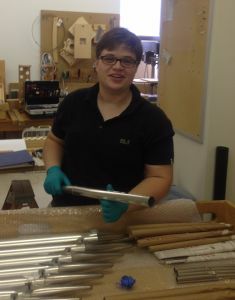 She works closely with Tonal Director Brian K. Davis in the tonal department where she is being trained in all aspects of voicing and placement of pipes in the organ.